Although you might not have noticed it, we actually recently deployed a new version of Typeracer. Most of the changes are “behind the scenes”, but there are a lot of bug fixes among them. For example, a lot of people complained that changes to their display names were taking up to 24 hours to take effect, and the profanity filter was blocking people from creating legitimate accounts (a Typeracer from Tallahassee, Florida was unable to enter the name of his city… oops!). Also, when someone left a race immediately after finishing, it might have appeared to others that he/she didn’t finish the race. All that his been fixed now. 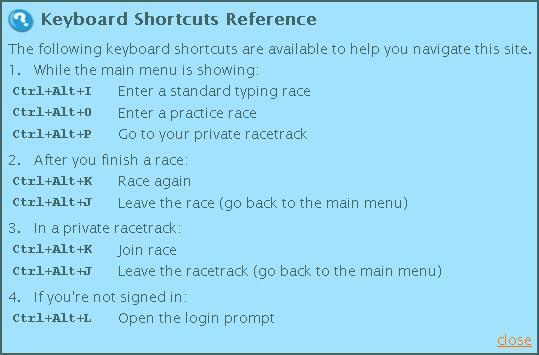 Here is a list of the new keyboard shortcuts. Give these a try, and if you have any comments, suggestions, or problems, please let us know. As usual, you can email support@typeracer.com, or email David directly at david@typeracer.com with any feedback about this new feature. If you have any suggestions that are not related to this feature, feel free to email us as well, as we really want to get a better sense of what is important to the typeracer community. We look forward to hearing from you, and seeing you on the racetracks! P.S. If you forget any of these keyboard shortcuts, you can hover your mouse pointer over a link like “race again” for a few seconds, and if the link has an associated keyboard shortcut, it will tell you! They don’t work if you have any firefox tools installed like FireBug etc. Sorry for last comment all the shortcuts work perfectly thanks. I’m still about to try them, but at first glance, they don’t seem really good for us Dvorak’s. Just a note, but it’s great to see hard work here and implementation of new features. Keep on! Why does it have to include Ctrl and/or Alt? They are interfering with my other universal shortcuts. Ctrl+Alt+K for eg. opens up KeePass. Maybe a single key would be better. Like pressing only ‘k’ after finishing the race would start a new one. Sorry that the hotkeys are interfering with your other shortcuts. You are glad to receive your feedback, as it allows us to improve based on our users’ needs. Thanks Bob. We will keep this in mind in the future as we try to improve the hotkeys, etc. Hotkeys are terrific. I can see requiring Ctrl, because if you ever introduce a mode where people are racing against the clock, someone might unintentionally trigger a hotkey by typing past the buzzer. But Ctrl+Alt shortcuts are traditionally reserved for application-independent manipulation of the desktop envrionment. For example, Ctrl+Alt+K switches me to Colemak! I recently found I could just do Tab-Tab-Enter instead of reaching for the mouse. That’s pretty convenient. Please consider adding a shortcut for dismissing the “You have been disqualified!” popup. Since the popup only appears on the main menu, the shortcut could be the same as one of the existing key combos (e.g. Ctrl+Alt+I or Ctrl+Alt+K), or it could be something simpler, like Enter. That request aside, thank you for adding these keyboard shortcuts! Thanks for your feedback, Fyda. I’ve recorded your suggestion for future improvements to this feature. It would be really nice if the German Double S in German texts could be changed in ss. We don’t have this letter on the keyboard and therefore can’t write it…. I just joined typeracer today and I am really bugged by the way that I get this pop-up that holds me back telling me that I have a typo: ” you pressed the space bar after the word “the”. Yeah, I know that. I am suppose to do that. And, it won’t let me move forward and meantime, the timer is going on. Also, When I get to the end, of the passage. I have to sit for a while before I can advance to the next race and I don’t know if I need to start typing the passage over again because I still have time on the clock. So, when I am done, I stop but my car is not at the finish line but way at the back behind everyone else because I got stopped to say that I hit a space bar after a word! At the same time, everyone else’s car is still moving and if I decide to start typing the passage over, my car still does not move! Where are the instructions. Where are the options for ME to choose beginner, advanced, etc. I am a typist, actually I am a transcriptionist!